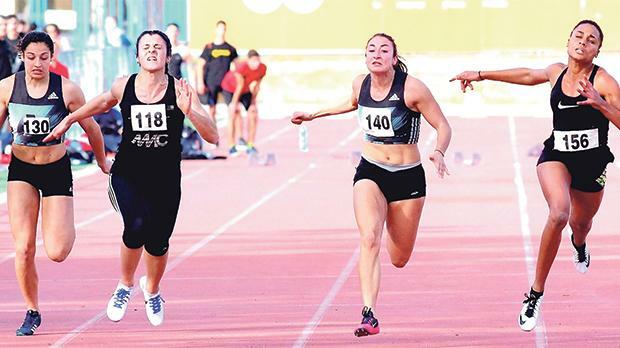 The Malta Amateur Athletic Association’s annual Track and Field Winter Champion-ships attracted a sizeable crowd to the Matthew Micallef St John Track on Saturday. For those looking forward to some hard fought competitions, the near 200-strong athletes’ gathering did not disappoint. The 60m finals were the climax of the afternoon. In the women’s race it was a very tight finish with just 0.07 separating the first four sprinters. At the end, it was Janet Richard who prevailed over Rachel Fitz. Although Richard and Fitz clocked the same time of 7.78 seconds, the photo-finish showed that Richard was a whisker in front. In the men’s 60m final, Luke Bezzina dominated and his winning time of 6.94 confirmed that he is in good form prior to representing the country at the European Indoor Championships in Belgrade this week. The women’s 3,000m race was won by Lisa Bezzina, another consistent athlete who has been clocking some impressive times. Bezzina had a battle with Mona Lisa Camilleri. At the finish line, less than four seconds separated the winner from the runner-up. Meanwhile, in the men’s 3,000m, Simon Spiteri’s strong finish was very much in evidence as he pulled away from Jean Paul Debono and Dario Mangion in the final lap. Spiteri’s fighting spirit won him many races last year. This same kind of character does not seem to be diminishing this year, making Spiteri another athlete to watch out for. In the men’s 600m, the top three placings were taken by Matthew Croker, Neil Brimmer and Jean Paul Debono. Croker’s winning time of 1:23.41 showed that his preparations for the 800m are going well. In the younger categories, Alessia Cristina, Rachela Pace, Sarah Bartolo, Sarah Chouhal, Sean Spiteri and Kurt Zahra lived up to their pre-meeting billing. In the youths girls 60m race, Cristina, a star performer in last year’s European Kids Athletics in Brno, was an outright winner in 7.93 ahead of Bartolo and Pace. The same trio dominated the long jump, albeit with different podium placings. This time, first place was taken up by Pace, followed by Cristina and Bartolo. The Chouhal surname, so synonymous with local athletics, was again prominent at the meeting when in the youth girls hammer Sarah Chouhal produced an all-time category best of 40.07. In the women’s open hammer, veteran Antonella Chouhal had a throw of 42.46m. Other noteworthy performances came from Zahra and Spiteri, first and second respectively in the youth boys 60m. Spiteri took top billing in the youth long jump with Luka Aras in second place. In the intermediates, sprinters Carla Scicluna, the Elaida twins and Nassim Dardouri also showed great promise. It is clear that with their level of commitment they will soon establish themselves among the best.